SCRAP (Scavenge, Collect, Reclaim, Attack, Prevail) is a real-time strategy game that turns one of the core RTS mechanics on its head. In most RTS, one of the core assumptions is that each player will be striving to constantly increase a steady flow of income, while another primary goal of each player is to disrupt or curtail the flow and rate of increase of their opponents’ income. 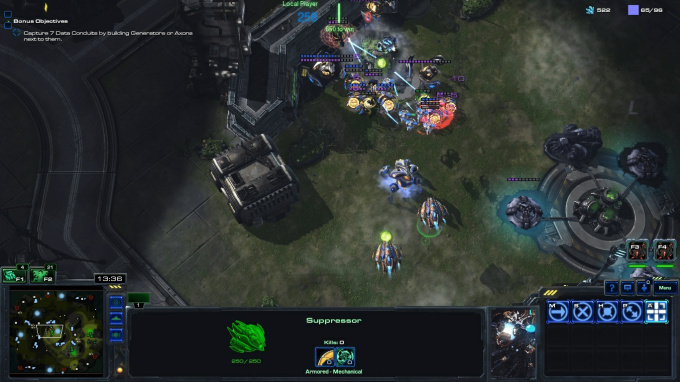 One of the game’s main themes is resource pressure. I specifically set out to create a strategy game in which a constant flow of income is not to be expected. Resource gathering will be in fits and starts. Players locate and mine out a resource cache in short order, then move on to the next while making hard decisions on how to spend the resources they just obtained. The game features a relatively flat tech tree, destructible resources, pre-defined base locations that players can steal from one another, mobile production facilities, and what I’m calling a ‘soft ammunition’ system. SCRAP features 2 factions at this time: the sturdy Fabricators, and the multifarious Dendrites. Since I released the 'public alpha' of SCRAP in July of 2017, I have released 6 updates to the mod: changing balance, restructuring the map, and working out bugs. During that time, I have started a game design apprenticeship, joining the fine folks working at Dream Harvest Games to work on an RTS project called Failure: NeuroSlicers. This has led to an unfortunate lessening of the frequency of updates to SCRAP, as I take on design tasks for Failure. I still managed to find some time, however, which leads us to today: the 7th update to the SCRAP Public Alpha, and my first major content addition to the mod. Since the last time I wrote about SCRAP, I have actually released 4 patches: mostly, I publish patch notes on my Discord channel, or my MODDB page (this article will be transferred there soon after its initial publication). This is an oversight and I hope to use this article to address the problem. I'm going to go over the changes, and the reason for them, in detail... but first, since many people may not be familiar with the mod I thought I'd do a brief overview. 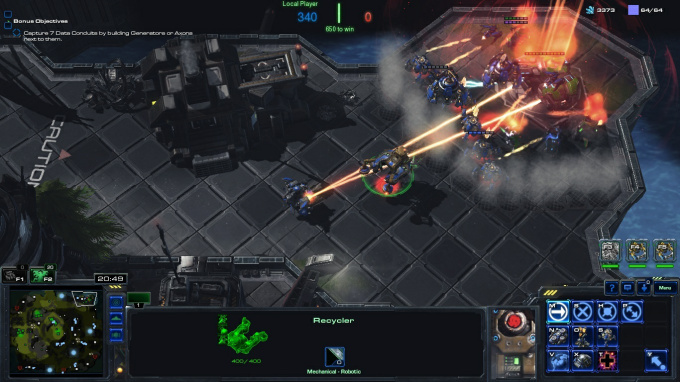 SCRAP is a tactical strategy game, a full conversion built in StarCraft 2's Galaxy Editor. It is (currently) a 1vs1 RTS battle, with players able to take the role of one of two factions. The Fabricators are industrial/construction robots, essentially mobile 3D printers, who use the resources they collect to build smallish armies of sturdy robots that primarily serve to augment the power of their central "hero" or primary unit. Each Fabricator player has one, and only one, Fabricator unit, which produces all units and builds all buildings for the faction: careful use of this unit is required to play optimally. 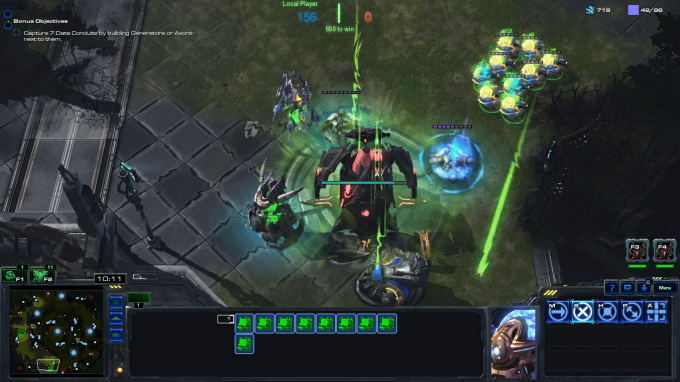 Managing your build queues, keeping it on the backline building infrastructure when you can but bringing its area of effect damage abilities into fights when necessary. The Fabricator can easily be pulled out of position or have its Energy (mana) overtaxed, and using it well is pivotal to a player's success in the game. The game's other faction is the Dendrites, and they couldn't be further from the Fabricators. They don't have a single core or key unit, and rely on swarm tactics, hit-and-run attacks, and disposable units to overcome their opponents. They produce fleets of Assemblers, large utility robots that expend themselves to physically convert into structures, units, and defensive turrets. Where the Fabricator's gameplay is about the careful application of a limited number of units, the Dendrites gameplay has a feeling of motion as you continually churn through your stock of Assemblers, turning them into tools that you can use to chip away at your opponent's advantages. The players in SCRAP are fighting, primarily, over 3 things: Scrap, Energy, and Data. Scrap is the game's primary resource, and is used to purchase units, structures, and upgrades. Energy is the cost of participating in combat: many units use Energy as a sort of ammunition to fire their weapons, and the Fabricator requires Energy to summon new units onto the battlefield. Data is the game's victory resource: the first player to accumulate 650 Data will achieve sentience and win the game. 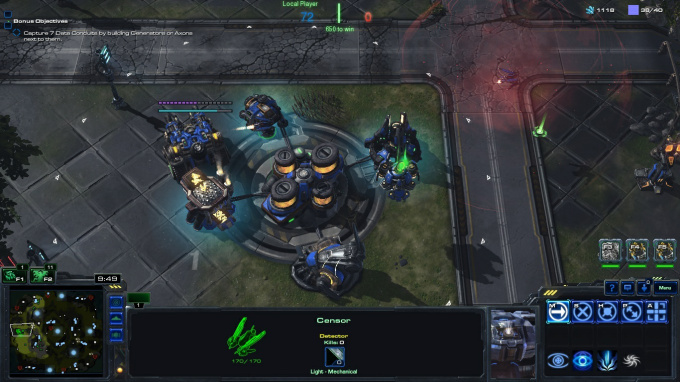 Players accumulate Energy and Data by capturing Generator Wrecks (basically, base locations) making the point of the game basically to capture and hold base locations. However, resources are often quite far from base locations, so players need to find a way to defend their holdings while still going out and aquring new resources with which to build and upgrade their armies. There's, ah, more to it, but I've dragged this on long enough. Let's get to the updates. Some of the biggest changes to the game have happened in the last 2 months, so I'll focus on these first. With each change, I'll describe the reason for the change and the expected benefits. The problem with Damaged Systems is that it was a bit mis-targeted. In some cases, players *wanted* their units to have Damaged Systems applied, to serve as damage soaks for enemy fire. This is one of several changes I have implemented to make Damaged Systems more purely a bad thing for the affected player. Now, when units enter Damaged Systems, they are more able to escape (because of the speed boost) but are far less useful (due to the increased hit to DPS via the damage reduction). I made the unit slightly less durable, but didn't want to overdo it. If Damaged Systems is still percieved as a potential advantage after this change, I'll look into further reducing the damage resistance that units under its effects recieve. Also, armies often had nothing, or little, to do while the game was in a build-up phase. 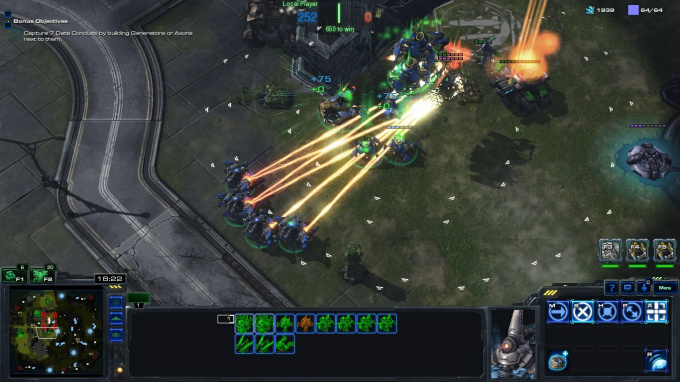 In a style similar to StarCraft, armies would just sit near a player's base, waiting for 'critical mass' before players would push out to attack an enemy. This change starts to weaken the relationship between harvesters and economy: now, armies can go out, kill creeps and buildings, and help the economy in their own way. Also, a player who has combat units but no (or few) harvesters can give themselves a little economy boost and get back into the game more easily. 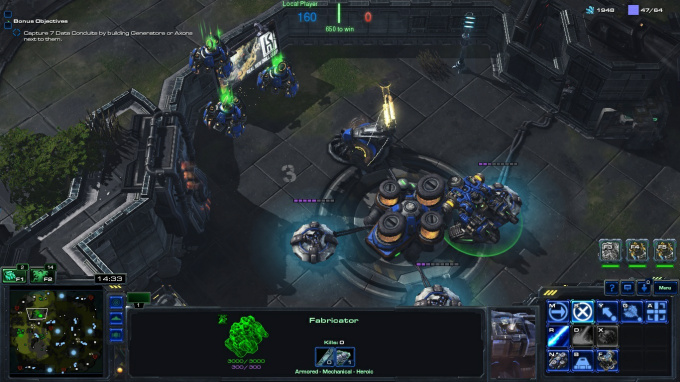 The Switcher (bottom center) is a flexible new unit whose weapon actually changes based on what weapon the Fabricator has equipped. They can be good against air swarms, individual heavy attackers, or light ground swarms. I came to feel that the Fabricators were too constrained by popcap: it becomes very difficult to field a balanced army in the late game. There are simply too many units and not enough ability to field them. This slight change allows basically one more Scrapper, or one more Absorber, or 4 more Censors, or 2 more Junkslingers. The Absorber is a redo on the unit's initial concept. It's still a heavy damage soaker, but now it's a bit more interesting to use (and to have it used against you). First off, the Absorber deals anti-air damage, as well as anti-ground. That's useful, but not exciting. Also, the Absorber interrupts spellcasting, making it much harder for enemies to mind control them on an even footing. The last and most important change is this: the Absorber now has a recharging energy shield. When that shield breaks, its damage and attack speed are both increased. This makes a damaged Absorber quite dangerous until it can be brought into Damaged Systems, making it important to either ignore them until higher-DPS targets have been killed, or to try and focus them down quickly early in a fight. The balance between heavy-but-limited and many-but-cheap has been an interesting one for me to navigate. Many players currently view the Fabricators as the less powerful faction, and this slight recalculation of their HP-per-cost should lead to an overall better balance between factions. This was a tough one: ignoring armor is such a major step in a game like this, but I needed to give each faction ways to deal with players who abuse Damaged Systems for their own benefit. The Scrapper is the Fabricator's answer to Damaged Systems (more units will be coming along this line eventually). The Junkslinger's damage has been reduced to 18 (from 21). One of the core tenants of SCRAP was always 'hard choices' - I want players to make decisions they're going to feel when they make them. And now, finally, I'm starting to build that into the game. In SCRAP, players will have a choice when it comes to high-tier units. They will basically commit irreversably to a tech path at tier 3, choosing one set of units, upgrades, and structures to unlock. Once that choice has been made, it's not able to be rescinded in match. I'm starting to build out the first of each faction's Tier 3 tech paths in this patch. The core of this is the Metallics research. This research unlocks the Scrap Foundry structure, with its attendant upgrades, passive abilities, and units. In the final product, there will be another path to choose with a completely different set of units (etc etc) resulting from it. The Scrap Foundry allows players to upgrade Scrappers into Switchers. It also has a passive effect, increasing the armor of all Recyclers by 4 and applying a 25% Time Scale to all Recylcers, enabling them to build units and use abilities that much faster. It'll do more stuff in the near future. Switchers are a unique unit. Their active weapon is tied directly to that of their parent Fabricator, allowing them to actually change what units they're good against with a quick research from the Survival Module. They can wield the Cascade Arc, which attacks air, interrupts spellcasting, and deals damage to groups of units at close range; the Impact Driver, which is a long-range single target weapon that deals bonus damage to Armored units; or the Laser Array, which deals damage at long range to groups of Light ground units. The Current is in a weird place right now, and always has been. It's a summoned unit, spawned in large groups from Assemblers as an active ability. They speed up harvesting for Receptors, deal damage to enemies when they explode, and their plentiful making them good damage soakers for Dendrite armies. But, they always either seem useless or over-powered, and it's been a huge struggle to get them right. With all of the changes to both factions, I'm opening them up a bit again: they move fast, hit decently hard, and now can spawn in ridiculous numbers with proper upgrades. I hope they start seeing more use again. Harbingers have likewise been in a weird place. They have phenomenal DPS, but melt to any AA fire. They're fast and brutal harassment units, but like Currents their either completely dominant or completely useless. Several patch changes have balanced out their counters, making them more reliable and earlier to access, so I'm willing to risk them being a little more useful again. Many of the Dendrites units were in a weird place, as it turns out. Needlers are snipers that players are intended to mass: they don't do much in small groups, but have a pretty nasty single-shot damage in groups of 9 or more (they're summoned in groups of 3 by the way). Their over-time DPS is low due to a low rate of fire, as well. In an attempt to make them more attractive, now they're better at killing armored targets due to their innate bonus to Armored units. Now, they also ignore Damaged Systems. Great for finishing off weakened targets and focusing heavy enemies. Hopefully they'll see some more use now. 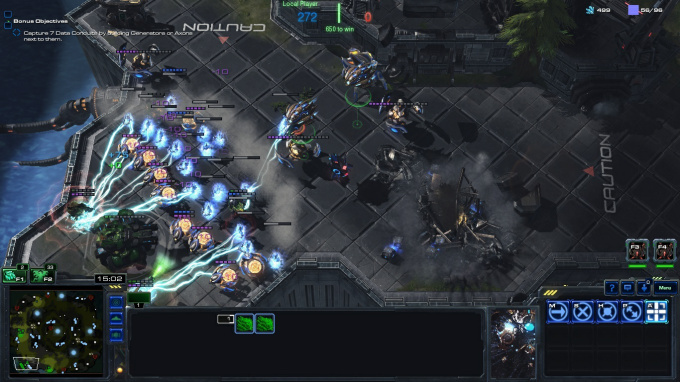 Dendrites have decent AA options (Needlers, Currents) but Harbingers were always a sticking point in Dendrite matches. Partially as a response to Harbingers, and partially as a general-use area ability, I've added Arc Field. Once the Dendrite player owns a Consensus Buffer, Assemblers can drain Energy over time to deal recurring damage to 3 units within a 10 range radius. Each attack does little damage by itself, but with multiple Assemblers it definitely adds up over time. Also, each friendly Current in the area increases the ability's damage, which makes having even a couple Currents mixed into combat more useful. Good against small-to-medium groups of air units, or en masse against the smaller armies of Fabricator forces. Less useful unless you commit pretty heavily to it in terms of Energy expenditure across multiple Assemblers. I explained how the branching tech path will work, above. Dendrites react slightly different to this than Fabricators: while -individual- Fabricator units will upgrade themselves into a Tier 3 version of that unit (much like how Zerglings upgrade into Banelings) Dendrites just produce them from Assemblers like with every other unit. This means that the Dendrite method is more streamlined, but Fabricators will be able to retroactively gain access to Tier 3 units while Dendrites will have to plan ahead for it: of course, they have more popcap to play with, as well. Suppressors will have a pernicious effect on combat: Dendrites use a debuff called the Dampener Effect to lower the effectiveness of enemy armies. Without the Suppressor, it can be hard to lure enemies into range of the Dampener Effect: an upgrade can allow Imbuer units to generate it, and there's a turret that can apply it to enemies, but the Suppressor can do it at range, and bring the pain of the Dampener Effect to enemies wherever they are. It should be interesting to see how this makes fights play out: the upgraded Dampener Effect decreases move speed, attack speed, and applies a stacking debuff to attack damage, as well. Where do I go from here? I'm targeting my efforts in the short term towards adding the rest of the planned units, upgrades, and abilities from each of the 2 Tier 3 tech branches introduced in this patch. Each faction, after this patch, will see 1 new ability, 3 new upgrades, and 3 additional new units. After that's done, I'll be ramping up efforts to onboard new players: I have a sort of active tips system in place of a tutorial, but it's only in the very early stages right now. I'm going to work on building that out more. Alongside this, I'll be working on a single-player version of the map for new players to learn on. I'm hoping that the combination of these two things will go a long way toward improving the new player experience. Lastly, I'll be working on a new version of the map, each faction's second Tier 3 tech path, and an overhaul of the implementation of Scrap and Energy. Scrap's current implementation discourages players from expanding early, so I'll be slightly changing how that works to get players out on the map contesting objectives earlier. And Energy doesn't have enough impact on combat yet: I want a player deprived of Energy for their units to hurt, to want to run away. I'll be looking at how each faction, and each unit's reliance on Energy works, to increase the importance of this system in the game. Thanks for reading. I hope to see you on the battlefield. An update on SCRAP's latest systems, launch date, and priorities going forward. No download needed! 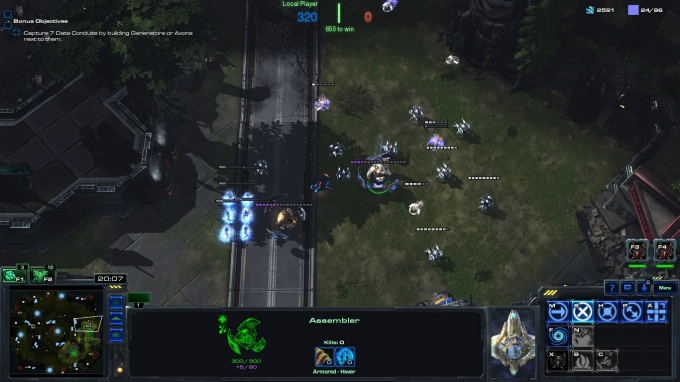 Just install StarCraft 2 and search "Public Alpha" in the Arcade. RT @Lonrem: @waywardstrategy Always. Well, when I'm not thinking about a mindless horde of undead at my disposal. S.C.R.A.P. has not been tagged yet.